Last week I went with some of my colleagues at Community Growth Institute on a two-day retreat so that they could see what I consider to be a brilliant application of neighborhood design principles. While you can study good design through text and pictures, immersion it is a completely different - and most beneficial - experience. 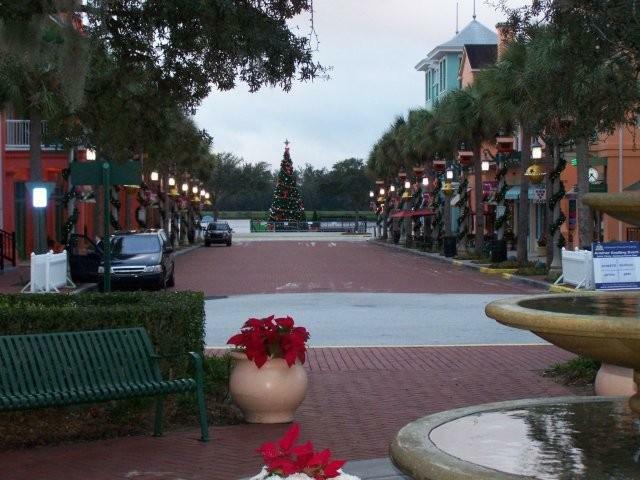 With that in mind, one of the stops our team from Minnesota made was in Celebration, Florida. By way of some context, at Strong Towns we are advocates of making better use of our massive infrastructure investments. Increasing our public Return on Investment (ROI), so to speak. While there are a lot of elements to this, in more cases than not it includes increasing the density of our current development pattern. When you start talking at a public meeting about increasing density, the typical reaction is fairly negative. And understandably so. If you look at our current development pattern - which most people would agree is uninspiring at best and depressingly ugly at worst - and then imagine squishing it closer together, it is not a pretty sight. If all you know is our modern pattern of development, you can't imagine more density. Low density is the way we all "escape" the blight that is the American public realm. The reason people commute for hours in congested traffic through miles of asphalt and billboards is because at the end of it all is their own private oasis. Their own personal place where they can escape the blight of the landscape they travel day after day. We all understand this. It is the current version of the American dream. The only problem is, we can't afford this style of living any longer. If more density in our development pattern is financially inevitable, than we have two choices. We either choose to live in a harsher reality, or we adopt a new and affordable development pattern that provides a higher quality of life, even with a greater density. At Strong Towns, we choose the latter. Our Placemaking Principles for Strong Towns are a place to start to envision a new model. Another place is on Facebook where, on the Community Growth Institute fan page, we have posted pictures along with a frame-by-frame narrative of our recent walking tour of Celebration. For those of you not on Facebook, I'll post some of those photos here over the coming months as part of our ongoing Brainerd/Baxter Strong Town series as a way to contrast the harsh elements most of us encounter in our daily lives with those present in a well-designed community. And if you are interested, Community Growth Institute and Strong Towns are planning to offer an annual tour for placemakers of sites like Celebration. If you want to receive information on our 2010 tour, you can email me at marohn@strongtowns.org. One other fun fact about Celebration: When we were envisioning the streetscape for the ideal town we feature on our home page, we incorporated a bit of Celebration's Market Street. Here is how it looked last week.